Jay Apking is a father, husband, actor, writer, director and athletic trainer living in Knoxville, TN. He has been working with children for the past 20 years starting with a children’s theatre tour out of the Barter Theatre in Abingdon, VA. He later began his own theatre company called The Janus Project in Cincinnati, Ohio and taught and directed children in elementary, middle and high schools across the region. He originated two summer camps, one in Hilton Head Island, S.C. that teaches acting, directing and playwriting, and one in Knoxville called “Discover Your Genius” based on the Great American Child series. Jay is dedicated to the idea that we all can elevate our society by expecting more from our children. If we set a standard for each age and set goals for our children, they will become more than we ever expected. This will lead to a happier, healthier and more successful set of American children we all can be proud of. Jay is always open to further discussion and new ideas based on these concepts. Please email him at jay@greatamericanchild.com if you would like to talk about how to make your children and our country the greatest on earth. Sarah is a mother of two and Professional School Counselor at two elementary schools in Knoxville, TN. She has worked in rural, suburban and also inner-city schools and with a wide range of children and families. Additionally, she is a National Board Certified Counselor with a background in Family Studies. She has coached several seasons of Girls on the Run as well as taught after-school ‘Cardiac Kids’ programs. Striving to educate, encourage, and nurture children, Sarah has written and taught the Discover Your Inner Genius summer camps by Great American Child. She continues to work with Jay on supporting family goals and enrichment of the whole-child. Jay met Sarah Hamilton at their daughters’ dance class. Upon learning of Sarah’s career as an Elementary School Counselor, they quickly discovered they shared similar values and interests in writing, child development, and education. What if we could set a standard for each American child to live up to and even surpass? What if each parent and teacher could point to a guide and tell all children, “We expect at least this much from you and here is how you are going to get there”? What if we encourage the next generation of children to elevate their lives and set a new course for health and culture for America and the world? Great American Child was started in 2005 by Jay Apking as a personal project – he wanted to give his niece something significant for her birthday. As he researched “How To Be A Complete 14 Year-Old”, he began to discover there were many things that go into being a great person and great American, and that all children and parents could benefit from this knowledge. Jay felt that if each child (and parent) would dedicate the early years to becoming well-rounded, maybe it would lead our citizens to good health, better careers, more joy in life, and more success for our country. Nine years later, the books were complete and ready for publication, with the hopes that all children would have access to tools that would lead to a greater American society, and thus a better world. 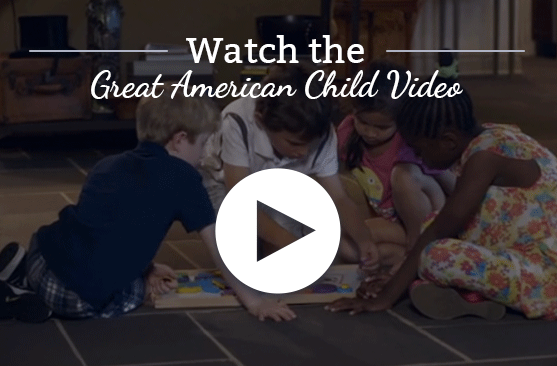 Great American Child encourages the life-long pursuit of knowledge and growth with age specific books and programs that spark curiosity through experience, enrich traditional education, and develop a healthy, happy, and successful individual.